I can never believe the “what ever happens, it happens for good. God thought that’s the best for you” quote. In case he really knew, then why did he let you dream about something at first place. Then snatched the stuff and worst of all doesn’t even erase off all the reminiscences. & those stupid memories follow you call your name loud and when you look around they’ll be gone. Like the Bisilu Kudure; yes sometimes people who taught you what it was become one. “Bisilu Kudure” !!! There is so much happening at work place that it’s hard not to mention about it and even harder to quote the details. There is a bigger event coming up tomorrow, that’s setting up a retail kiosk of our respective client. Our client does business on auto parts so we are kind of having a race track around the bay and a virtual tour of the store inside our principle manager’s room. Hopefully we’ll emerge winners on this one, wish me luck please & I’ll put up the photos later. Someday back just outside Corner House we were stopped by a woman holding a baby. I don’t know if it was her baby, but she claimed money in its name. “My baby hasn’t eaten since many days” she begged. I ignored the lady and was in the car soon. I guess Pati gave away few bucks behind me. Such a stone hearted lady, he mumbled while driving. & people who have agreed with him, yes I am store hearted chick to all the people in the world who have the ability to work but chose the easier way of begging/stealing in the name of sympathy. If you are helping such people, that’s not showing kindness at all. It would in turn be encouragement for them to stay idle and also motivate the rest to start the same. My heart goes out for the limping man who is part of dusters group at my work place. He walks a lot even though he is handicapped, just because he believes that he can do it for himself and for his family. By the way such people don’t even expect empathy from you. Just holding door and a smile would do wonders. If you are nodding your head now, I am pleased. If not thank you for reading by have a great weekend. How do you savor the lip-smacking delicacies from across Karnataka & India without actually traveling? Simple, all you have to do is get into the Dasara Ahara Mela at the CADA Office premises. It is one gastronomic ride for all the foodies & offers some healthy snacks to the fitness freaks as well. We started off tasting the Paddu served with mint chutney & aaloo gravy. The Paddu’s were very hot but the stuff that came along weren’t. The aroma of the Davangere Benne Dosa was too much to resist. We skipped some stalls in between and reached to order some. They were priced 15 bucks for a dosa along with plain chutney and aaloo palya & the taste was heavenly. While relishing the dosa we saw a bunch of females kneading the dough, making and burning the Bijapur jowar rotti. The hengai was boiling hot in the large vessel. Next thing it was in our hands, one rotti, some hengai, a red chutney pudi all for a cost of 20 bucks. Al though the rotti was soft, the hengai failed to cater our spicy buds and was less on gravy as well. Bangarpet Panipuri had its talk in most of our local papers, curious about the taste we decided to take it on. A plate of it included a small bowl of paani, 5 puris costing 10. Crispy and not so spicy, much disappointed Pati said that the ones near the Kuvempu trust taste better. It was time we had something spicy and our attention went on to Kerala stall. The lady was selling puttu for 20 bucks and there was hardly any content in the plate. She was always giving away nool puttu (3 in numbers) for 20 but the nool was just 5 starnds of rice vermicelli. We decided to give it a skip and landed in the AP stall. The menu had Dum Biryani, Kababs and Omlettes. We took a chicken biryani that consisted of 2 chicken pieces teamed with some raitha priced 40 rupees. It was a disaster again; the taste was not so apt for a Hyderabadi cuisine. The stall next to it was having all kinds of Kababs and we opted for a chicken item that consisted of 5 kababs some boneless & some with bones charged 20. “Machli jal ki rani hai” and we thought we should have her next. Fish fry at the Manglorean stall gave us a plate having 5 pieces of very spicy fishes. They were so hot that we had to opt for the home made apple vine at the Coorg cuisine stall. It tasted real good hence we decided to give the grape a try as well, & it was even more divine. All for 40 bucks!! The pink cotton candy sticks were irresistible and I persuaded Pati to get me one. They charged us 15 for a chota stick. Somehow the sweet at the end of all the eateries was not sufficient, with two minds we barged into the “Benne Gulkand” outlet. A plate had watery gulkand, topped with very few dry fruits & 8 slices of banana upon that was a small dollop of butter. Too much for a sweet!!! & I was on a two day detox after that evening, Sigh….. It was Vijayadashami day and I found heaps of crowds marching on the road. I assumed that these people had come to watch the world famous Dasara Jambu Savari; they all proved me so wrong. It was to watch Janakiraama, a.k.a Jackie at the theatres. Yes Jackie is a crowd puller commercial movie directed by Suri of Duniya fame teamed well with mass lyricist Yograj along with musician V.Harikrishna. A feast to all the power star fans who were deprived of his mass dialogues/acting in his previous movie Pruthvi. A simple story, which drags a bit somewhere in the middle, somehow knit so that all the characters meet by co-incidence which is well managed by our hero who does everything from being a good brother, great speaker, gives shelter to the escaped criminals, plays cards well and makes money, honest friend, bad son, to-be realtor, saves heroine, helps police, collects roll call, guards dead body, does stuff that the cops cannot do, traps & rescues his girl and finally the motive of the movie finds the runaway pujari’s daughter. The actions are from different Danny, very neat and innovative; although the beds on which the grass was spread to help the stunts were visible at many sequences. Dialogues had lot of punches, especially why the hat of the policemen is folded at one side, the elephant killing the politician who almost signed the 60 acres land and the english speaking Rangayana family. The into song has great choreography, credits to Imraan, Harsha and Ganesh. Of course Ekka Raja Rani and Shiva anta hogutide has captured the hearts of the youth. Sumithra plays hero’s mom and has a voice dubbed by someone else which is not very good probably the role she plays asks for that rigid voice. The heroine is so plain and has no role to play, even when she has, she does not even attempt to. She is just the mac-make-up chick in the movie. Rangayana Raghu takes away lot of accolades for his comedy. Watch the movie for the first-rate songs & Puneeth’s dance in them, for knock dialogues and Puneeth delivering them, for unlike actions and Puneeth hitting the opposition, for the effortless story and Puneeth taking it along; heck just watch it for Puneeth I say. Jackie Jackie Jackie Jackie Jackie Jackie Jackie Jackie!!!! New conversations are good. Chat that involves knowing the other person and letting them know who you are. Those vivid questions, smiles, finding out what’s common, giggles, some apprehensions until you get to the next phase. Those two people do not have to be in love for it to be interesting. It can be two 30-ish ladies & neighbors, roommates in the new academics and even kids traveling to school in an auto. Al though it certainly gets better if they are in love, adds more to the mushiness. Else I will be one "powerless" person, come think of it akka's "power" portfolio is "the" reason of the rebel. Shame!!! P.S: Suvarna is having the highest TRP these days, all thanks to Ranganna, the head of the channel. His debates are clean n crisp. Dot? Already? You must be wondering as to what happened to the review content. Yuen Woo Ping has done the stunts, Stan-Winston studios have done the visual effects, editing by Antony Gonsalves, & then you have uninspiring music by A.R.Rehman teamed with Resul, oops I forgot the Hollywood famed Bachan bahu, just there to kiss & not act. Wait a minute, the whole hype is that it’s a Rajni starer. But where & what has rajni done in the movie. I would say nothing, his entry is sober, & did not get any whisles or shilpis. He adds feeling to the machine (I wonder how) & which then talks with the mosquitoes, helps heroine do malpractice? For the first half, you can sit back and perhaps even enjoy, if I can claim that, since the script is working – in the sense things are happening. Then there is robo raising from garbage like phoenix, Danny who creates red raged Chitti but does not use him for his work but gets killed in a horrible way, Chitti laughing “he ha he ha he ha”, Aish dancing like a peacock in Machu Picchu, some kidnapping by the robot, then terrible chase scene by the police who refuse to live, robot building his own empire but not creating a “robo-sapiens” (I was so depressed I say) and then anaconda Rajni-robo, Rajni-Robo on wheels and all that shapes that ever exist. Oh how could I forget the judicial verdict, it was so simple I tell you, I mean after watching that I wondered why Ayodhya verdict took 60 years. Finally you may say that it’s a Rajni movie hence it needs no logic. But they also said that it’s a sci-fi but then why would a Rajni fan go to watch a sci-fi movie with him on it? I have no clue; you can watch it & let me know. It’s a brightly lit room. The table has lot of X-rays, medical reports, journals, a stethoscope and the BP machine. The doctor couple of minutes ago did a thorough examination on me after making me lay on the resin bed which stenches of sanitizer & is by the corner of the room. He takes a final look at the report, places them on the table, looks at us and lets out a big sigh. I was already sweating, Pati gave me his hanky. “Kavya, can you show me your hands” said the doctor. “Now do how I say. Just open your fists and close. Keep doing it until I tell you”. I started the process, still sweating. The tension was at its peak, few minutes from then I could feel something moving. I stopped the close-open exercise and checked my palm. I could see a red noodle like creature moving between my fingers. I almost fainted by that sight. “How How” I shouted. I suddenly felt the presence of all them at once. The pain gushed all over my body especially the hand. I could still see it. The doctor just slit my palm and the disgusting creature popped its head out. Then with the same knife that he cut me, he chopped off that worm. It came to a stand still. Then he neatly used his forceps to pull out the dead mass. & then I realized that it was a damn dream. It’s all my stupid little sister’s fault. 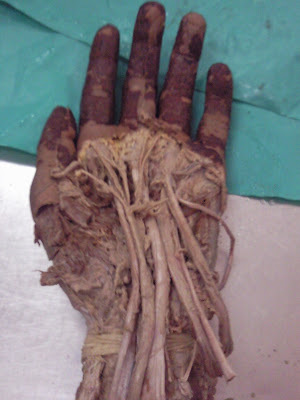 I mean she has taken a pic of the hand she dissected at her college and had to show me. Bleedy the same hand haunted me that night. You won’t believe how happy I was at that moment I did not have any worm-inside-disease. Anyways let me leave you’ll with that pleasant haath.